This section examines the Police Lotus Cortinas that were used in period. It was Graham Arnold, the Lotus Group Sales Director, who had the idea that seeing a Lotus Cortina being used as a Police Car would add kudos to the marque. The popular pursuit car at the time was the Mk II / S Type Jaguar, which was employed as the villains were using the same car as getaway vehicles. The Lotus Cortina offered similar performance with better handling, the same amount of space inside at a considerably lower price. Only a handful of Mk 1 cars were sold as Police Cars, and then only once the car had been made reliable with the leaf spring rear suspension. Ford persevered with the Mk 2, which was more successful and even made as a four door version. 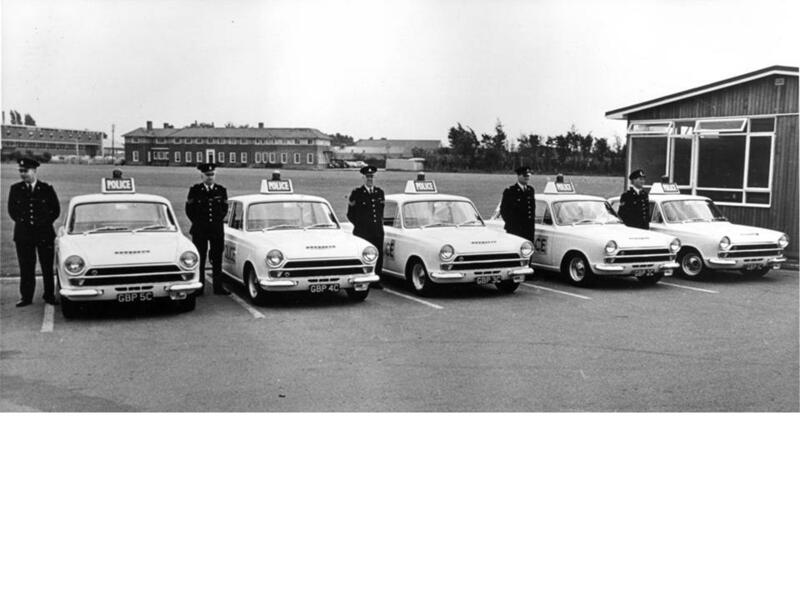 I have been told by a reliable source that there were a couple of four door Mk 1 Lotus Cortinas made for a particular Police Force, but I haven’t yet found any hard evidence! Enquiries are ongoing, however. Keith Halstead, Andy Goode, Graeme Farrar and Malcolm Rimmington all own Lotus Cortina Police cars, and have provided much of the information contained in this section. Neil Quinn, owner of GBP1C before Keith, did a considerable amount of the early legwork researching both Mk 1 and Mk 2 Police Lotus Cortinas when the cars had been all but forgotten in the 1990s. Many of the photographs on here had been collected by Neil after visiting many Police authorities and interviewing several individual officers who used the cars at the time. His work paved the way for the preservation of these interesting cars, and the continued research being undertaken by the current owners.